Advantages: new mold kits of modern US water and fuel cans. 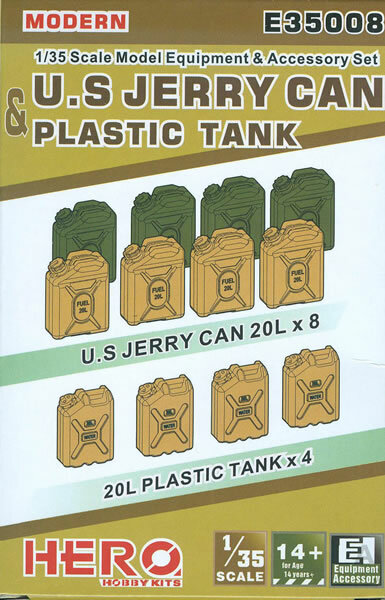 For many years the US Army used two types of five-gallon steel cans: a screw-top model that was for fuel (a filler spout screwed into the opening) and a lined flip-top model for water (both potable and non-potable, usually noted by stenciling on the cans). But they were subject to damage or bending as well as damage to the lids and as such could be a problem. Starting in the early 1980s first the water cans and then the fuel cans were replaced by modern plastic ones made of heavy duty plastic. Both cans had embossed on them what their purpose was for and as the first ones fielded were for water there was not a problem with that. Those cans were black plastic, but once the US switched to the desert in 1990 they also now come molded in sand tan. The fuel cans were introduced about the same time and come in either forest green or sand. This is another new “niche” company making accessories for 1/35 scale vehicles and dioramas, and this is one of their first eight offerings. The others include 200 liter/55 gallon drums, German jerry cans, WWII jerry cans, traffic barricades and cones, and a set of bricks. All are new mold items with the water cans coming in three parts and the fuel cans in four. In summary, this is a nice way to bulk up your vehicles with water or fuel cans even if a bit on the pricey side.